The gynocentrism is a concept that is "focusing the woman" and tend to "discriminate the man". The term is derived from the ancient Greek "gynaikos" (Gen.) = wife. He goes back to Iris Marion Young[wp], who in 1985 until 1970 featured the prevailing liberal, radical and socialist feminist theories as "humanistic feminism" and named the emerging theories as gynocentrism or gynocentric feminism. Another thought leader of this theory is the sociologist Dorothy Smith[wp], their approach to a female-centered feminism is based on the shared experiences of women in a male dominated world. The theories of gynocentric feminism are associated with the second wave of the women's movement[wp]. Gynocentrism is a specific form of sexism, in which the male is often referred to as inferior. Silently it is set the human being as woman and the female point of view as the universally valid. In the model of gynocentrism women are the center of religious, economic and social life in this theory and have certain gender-specific characteristics that drive the development of humanity as a whole or positive affect. These include empathy, so-called emotional intelligence, pacifism and other properties that are attributed gynozentrischen feminism of women. These properties are contradicted by a number of international studies which show that women as often as men almost exactly to violence prone. Nevertheless, this is still often a taboo subject, grade in domestic violence. From this unreflective and more positive view of women compared to men, feminists justify the need for social control by women and a matriarchal society. This produced under this consideration ethical supremacy of the woman is at the core of some gynocentric theories. Gynocentrism often occurs in the context of radical feminist theories. These theories are studied mainly related to gender studies and feminism in the United States. In the European postmodern feminism the gynocentrism plays hardly any role, here the focus is on the removal of gender restrictions in society. In the gynocentric influenced archeology and historical research finding, researching and proof of matriarchal cultures play a significant role. Moreover, the story is examined for the role of women, for example, as a promoter of culture, social development and also as victims of male supremacy positions toward. Another area of gynocentrism is the female-oriented spirituality[wp]. Various cults goddesses represented the symbolic level, while other approaches such as the development, androcentrism and also the language of the Christian churches and religions in the world examine the issues. The objective is, among other things, the recognition of the female role in the Christian churches. Often the Gynozentrismus mixed with the magic or esoteric approach of feminism. Problematic and can not be proven true, the claimed priority of the feminine, the principle of mere reversal of the patriarchal system is controversial, as is the uncritical acceptance of the immanent essence (ie, immutable, biologically given) believed female and male characteristics. In addition, some representatives of the gynocentrism contradict some hardly contestable archaeological and historical evidence about the mainly male-related development of the cultures of writing and technological achievements. Furthermore, the critically considered, in some quarters regarded as a conscious disregard of the existence of historically important female characters, the male viewed as typical motivations and behaviors loaded in this world picture of the day, such as Erzsébet Báthory[wp] and Margaret Thatcher[wp]. Another objection against radical and gynocentric feminism is the disregard for the statistically considered positive development for women's rights in recent decades, for example, over half of private wealth in the United States in female hand and more girls than boys attend secondary schools. The gynocentrism sees this as progress indeed, but hardly moves from the traditional role of a victim, a common example of this is Carol Gilligan's Myth of the shrinking Girl). Whether it is necessary to balance the gender ratio in order to create a balance between men and women or to prevent emerging negative stereotypes, is neglected in gynocentrism. Gynocentrism n. (Greek, γυνή, "female" - Latin centrum, "centred") refers to a dominant or exclusive focus on women in theory or practice; or to the advocacy of this. Anything can be considered gynocentric (Adj.) when it is concerned exclusively with a female (or specifically a feminist) point of view. Gynocentrism 2:0 – refers to a cultural intensification of the gynocentric tendency, arising in Medieval Europe during a period cross-cultural influences and momentous changes in gendered customs. Beginning in around the 12th century European society birthed an intersection of Arabic practices of female worship, aristocratic courting trends, the Marian cult[ext], along with the imperial patronage of Eleanor of Aquitaine[ext] and her daughter Marie De Champagne who together elaborated the military notion of chivalry[ext] into a notion of servicing ladies[ext], a practice otherwise known as 'courtly love'[ext]. Gynocentrism 3:0, which refers to the developed economy with service industry where women can enter labour force and gain financial independence from men, which (1) creates demand for more rights vis-a-vis men because there is no longer a trade-off as in traditional relationships, and (2) renders women free to pursue increasing degrees of relational status as desired. These factors, in combination with the contraceptive pill, have given gynocentrism increased motility. 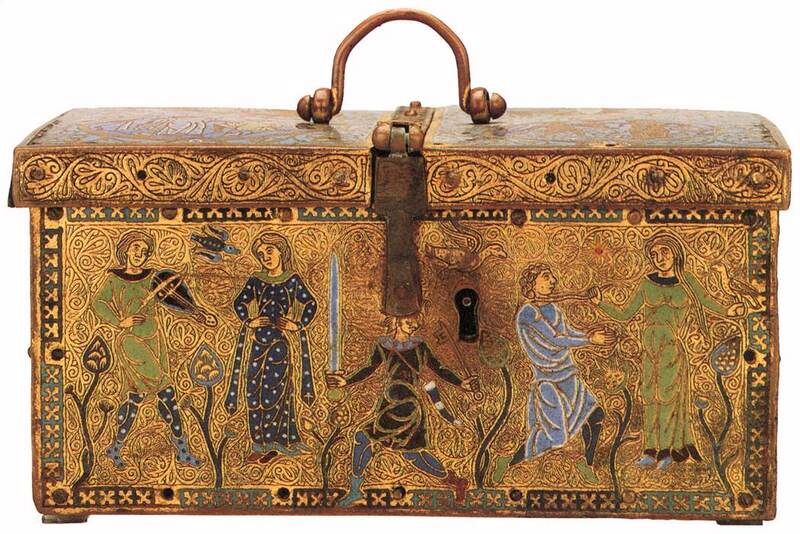 The golden casket[ext] above depicting scenes of servile behaviour toward women were typical of courtly love culture of the Middle Ages. Such objects were given to women as gifts by men seeking to impress. Note the woman standing with hands on hips in a position of authority, and the man being led around by a neck halter, his hands clasped in a position of subservience. It's clear that much of what we today call gynocentrism was invented in the Middle Ages with the cultural practices of romantic chivalry and courtly love. In 12th century Europe, feudalism[wp] served as the basis for a new model for love in which men were to play the role of vassal to women who played the role of an idealized Lord. C.S. Lewis, back in the middle of the 20th Century, referred to this historical revolution as "the feudalisation of love," and stated that it has left no corner of our ethics, our imagination, or our daily life untouched. "Compared with this revolution," states Lewis, "the Renaissance is a mere ripple on the surface of literature." With the advent of (initially courtly) women being elevated to the position of 'Lord' in intimate relationships, and with this general sentiment diffusing to the masses[ext] and across much of the world today, we are justified in talking of a gynocentric cultural complex[ext] that affects, among other things, relationships between men and women. Further, unless evidence of widespread gynocentric culture[ext] can be found prior to the Middle Ages, then gynocentrism is precisely 800 years old. In order to determine if this thesis is valid we need to look further at what we mean by "gynocentrism". The term gynocentrism has been in circulation since the 1800's[ext], with the general definition being "focused on women; concerned with only women." From this definition we see that gynocentrism could refer to any female-centered practice, or to a single gynocentric act carried out by one individual. There is nothing inherently wrong with a gynocentric act (eg. celebrating Mother's Day) , or for that matter an androcentric act (celebrating Father's Day). However when a given act becomes instituted in the culture to the exclusion of other acts we are then dealing with a hegemonic custom - i.e. such is the relationship custom of elevating women to the position of men's social, moral or spiritual superiors. Author of Gynocentrism Theory[ext] Adam Kostakis has attempted to expand the definition of gynocentrism to refer to "male sacrifice for the benefit of women" and "the deference of men to women," and he concludes; "Gynocentrism, whether it went by the name honor, nobility, chivalry, or feminism, its essence has gone unchanged. It remains a peculiarly male duty to help the women onto the lifeboats, while the men themselves face a certain and icy death." At the base of gynocentric culture lies the practice of enforced male sacrifice for the benefit of women. If we accept this definition we must look back and ask whether male sacrifices throughout history were always made for the sake women, or alternatively for the sake of some other primary goal? For instance, when men went to die in vast numbers in wars, was it for women, or was it rather for Man, King, God and Country? If the latter we cannot then claim that this was a result of some intentional gynocentric culture, at least not in the way I have defined it here. If the sacrifice isn't intended directly for the benefit women, even if women were occasional beneficiaries of male sacrifice, then we are not dealing with gynocentric culture. Male utility and disposability strictly "for the benefit of women" comes in strongly only after the advent of the 12th century gender revolution in Europe - a revolution that delivered us terms like gallantry, chivalry, chivalric love, courtesy, damsels, romance and so on. From that period onward gynocentric practices grew exponentially, culminating in the demands of today’s feminist movement. In sum, gynocentrism (ie. gynocentric culture) was a patchy phenomenon at best before the middle ages, after which it became ubiquitous. The Querelle des Femmes[ext] translates as the "quarrel about women" and amounts to what we might today call a gender-war. The querelle had its beginning in twelfth century Europe and finds its culmination in the feminist-driven ideology of today (though some authors claim, unconvincingly, that the querelle came to an end in the 1700s). The basic theme of the centuries-long quarrel revolved, and continues to revolve, around advocacy for the rights, power and status of women, and thus Querelle des Femmes serves as the originating title for gynocentric discourse. If we consider the longevity of this revolution we might be inclined to agree with Barbarossaaa's claim "that feminism is a perpetual advocacy machine for women"[ext]. To place the above events into a coherent timeline[ext], chivalric servitude toward women was elaborated and given patronage first under the reign of Eleanor of Aquitaine[wp] (1137-1152) and instituted culturally throughout Europe over the subsequent 200 year period. After becoming thus entrenched on European soil there arose the Querelle des Femmes which refers to the advocacy culture that arose for protecting, perpetuating and increasing female power in relation to men that continues, in an unbroken tradition, in the efforts of contemporary feminism[ext]. Writings from the Middle Ages forward are full of testaments about men attempting to adapt to the feudalisation of love and the serving of women, along with the emotional agony, shame and sometimes physical violence they suffered in the process. Gynocentric chivalry and the associated querelle have not received much elaboration in men's studies courses to-date, but with the emergence of new manuscripts and quality English translations it may be profitable to begin blazing this trail. Dominated by or emphasizing feminine interests or a feminine point of view. The female values have become the values of America(nized countries). Commitment is more important than INDIVIDUALITY. ↑ Adam Kostakis, Gynocentrism Theory[ext] - (Published online, 2011). Although Kostakis assumes gynocentrism has been around throughout recorded history, he singles out the Middle Ages for comment: "There is an enormous amount of continuity between the chivalric class code which arose in the Middle Ages and modern feminism... One could say that they are the same entity, which now exists in a more mature form - certainly, we are not dealing with two separate creatures." ↑ The New Male Studies Journal has published thoughtful articles touching on the history and influence of chivalry in the lives of males. This article based on an article Gynocentrism (8 November 2010) from the free Encyklopedia Wikipedia. The Wikipedia article is published under the dual license GNU-License for free Documentation and Attribution-ShareAlike 3.0 Unported (CC BY-SA 3.0). In Wikipedia is a List of Authors available those who worked on the text before being incorporated in WikiMANNia. This article based on an article About gynocentrism, gynocentrism.com on July 14, 2013. This page has been accessed 12,928 times and contains 24,840 characters or 3,561 words.